On the most basic level, the two novels tell the story of Charles Dingillian. Called “Chigger” by his family, he finds himself on a Heinleinian adventure that chronicles his journey from the Earth to the Moon and an impending trip to the stars. Joining him in the adventure, which he narrates, are his older brother Douglas, and their younger brother Bobby, whom they call “Stinky.” Like many other children of divorced parents, they find themselves in a custodial and emotional tug-of-war. Complicating their relationships are some basic personality quirks: Stinky is spoiled rotten, Charles lacks the ability to assert himself, and Douglas faces sexual identity issues. Furthermore, the divorce has scarred just about every relationship in this postmodern family, with everyone feeling hurt and angry with everyone else. Nonetheless, their father Max offers to take them on a trip to the moon, where offers for work as an indentured servant on one of the extraterrestrial colonies wait. However, both the novel and the journey become much more complicated than they initially appear. Max, who retains temporary custody of the kids when the story starts, faces bankruptcy and is looking to leave the planet before things get really bad. Most well-versed sf readers will recognize this futuristic Earth that is literally deteriorating under the weight of too many people and a still strengthening greenhouse effect. Large meta-national corporations are moving their resources to the interstellar economies as quickly as possible. 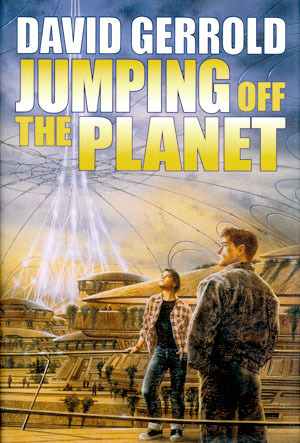 Given the backdrop and the familial issues the Dingillians face, including the fact that their mother, Maggie, obtained a judicial order explicitly stating that Max may not leave the planet with the children, it comes as no surprise that the trip ends up going in completely unplanned directions. The most amazing thing about these two novels is that Gerrold really pulls off what he intended: a Heinlein juvenile where the family flies apart instead of growing closer. In fact, as if to emphasize where he wanted to depart from Heinlein, Gerrold has the children obtain a legal divorce from their parents at the end of Jumping off the Planet. In addition, throughout the two books, Gerrold maintains the pace you would expect from a Heinlein juvenile, and pushed the Dingillian children into one predicament after another. From the moment they leave the Earth’s surface via the Beanstalk, an elevator that goes from Earth to a space station in geosynchronous orbit, the children face a series of alien environments and perils, often with only each other to trust. As they learn what it takes to survive, they learn more about themselves and find a way to start trusting each other again. But as stated before, the books are more involved than the plot suggests. Both Jumping off the Planet and Bouncing off the Moon are also about ideas and issues, and Gerrold makes sure to pack many into them. The recurring issue that permeates the two novels is what constitutes a family and how the family interacts–issues that currently touch the gay-rights movement, remarried parents, and adopted children seeking out birth parents. It’s clear in these two novels that Gerrold advocates expanded definitions offamily. While the two divorces impact the notion most noticeably, Douglas’s sexuality also plays a role in determining what the family is. As a result of their divorce from their parents, Douglas, who is near his eighteenth birthday, is made the legal guardian of Charles and Stinky. Because he fell in love with another man during the first part of the journey, Douglas asks the other two to accept his new love, Mickey, as part of the family. Another aspect of the book addressing the issue is that Maggie has moved in with her lesbian lover. Furthermore, the climatic ending of Bouncing off the Moon forces the Dingillian children to reassess their family yet again. Given Douglas’s homosexuality, it comes as no surprise that the novel addresses gay and lesbian issues. In fact, the world that Gerrold pictures is incredibly gay-friendly with homosexuality promoted by the United Nations–to the point where college scholarships are offered to those who undergo sexual orientation adjustment as a way to decrease the overcrowding of Earth. (Those who are born gay don’t get the scholarships, though.) However, Gerrold explores gender roles outside of orientation as well. Some of the handling is subtle, as in a sequence in Jumping off the Planet where Charles befriends what he thinks is another boy only to find out later that he is a she. However, in Bouncing off the Moon, Gerrold makes a much more obvious statement about it when he disguises Charles as a pregnant woman while the Dingillian children attempt to travel along the moon’s transportation system incognito. Charles ends up discussing the experience with Mickey and concluding that many act out in expected behaviors rather than how they truly feel. Charles even goes so far as to consider whether or not this connects with notion of sexuality, but no farther. In addition to addressing sexuality, gender issues, and what constitutes a family, Gerrold also addresses sentience and artificial intelligence. In Jumping off the Planet, Max and the children’s trip up the Beanstalk is paid for by a corporation that has him smuggling an item off the Earth. To hide it, he places it in a toy monkey he bought for Bobby. During the course of events, the children discover that the item was a prototype of an artificially intelligent processor capable of true sentience. As an unintentional result of Max placing it in a memory processor slot, the processor ends up taking control the monkey. By the end of Bouncing off the Moon, legal issues arise over ownership of the monkey (which the children name HARLIE) and the processor within–Bobby got to keep it and its contents when the children divorced their parents. In desperation, the Dingillians decide to let HARLIE defend them in court from companies that are trying to take custody of them to get to the processor. HARLIE ends up making a legal argument stating that as an intelligent, sentient being it should be considered a free entity and that forcing ownership upon it would amount to slavery. Despite the comical overtone of having a monkey making legal arguments, Gerrold makes valid arguments for how we should treat artificially intelligent devices in the future, should computer engineers achieve it. Gerrold also manages to give good reasons as to why they must remain property. (Similar arguments occur in Gerrold’s early novel, When Harlie Was One.) Fans of Star Trek: The Next Generation–as Gerrold is–may also recognize elements here of the Melinda Snodgrass-authored episode “The Measure of a Man,” in which the android Data ends up in court to prove his own sentience and secure his rights to self-determination. However, the Star Trek episode unequivocally comes down on the side that the rights of artificial beings must be recognized, while Gerrold here reaches no solid conclusion; the participants in the case withdraw their claims, leaving the Dingillian children in possession of the monkey without a final ruling. I suspect that the similarity to “The Cold Equations” is intentional. 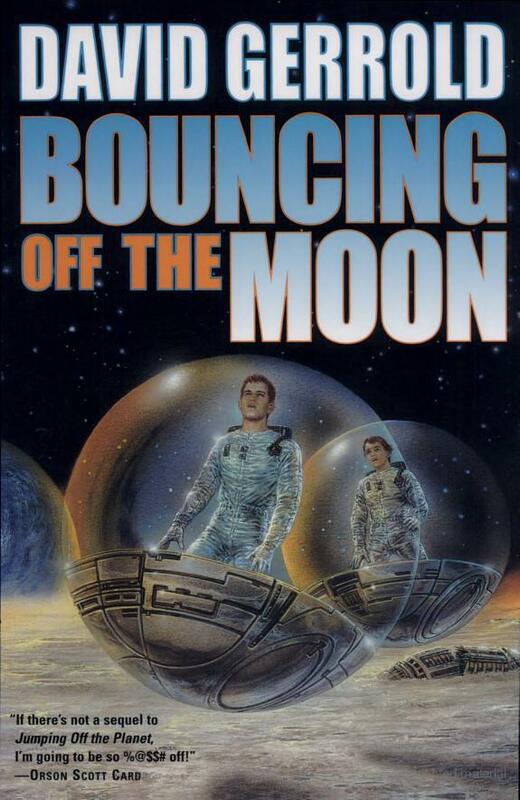 There are too many sf references in the two novels, especially in Bouncing off the Moon, to believe otherwise. Moon installations are named after Asimov and Heinlein, and Alexei tells a lunar legend that incorporates that monoliths from Arthur C. Clarke’s 2001. A humorous reference occurs when the Dingillian children discuss emigration possibilities; they mention, almost as an aside, that the Rand and Hubbard colonies are too ideological and dysfunctional to seriously consider going to. However, Gerrold may have somewhat overdone the references; when encountering a chapter titled” At the Mountains of Madness,” I half expected some sort of Lovecraftian alien to appear in the story. It turned out that the chapter title only referred to a mountain range on the moon itself. Gerrold gives us believable characters to sympathize with and offers numerous ideas to play with. Fans of hard sf will get a kick out of Gerrold’s attention to technical details. The novels also manage a kinetic pace, no small feat considering the number of weighty issues considered in the two books, and as a result, you feel as though you are coming along on an adventure as well. While Gerrold can be heavy-handed with the issues he addresses, he also has a knack for inserting a little humor when the situation warrants it. Overall, these two novels are incredibly enjoyable. This entry was posted in Book Review, David Gerrold, Matthew Appleton. Bookmark the permalink.